I find it hard to stay very raw when the weather is so cold, but I do keep 2 out of 3 meals raw everyday. 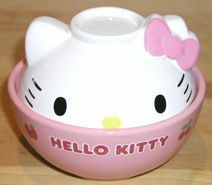 This is my newest acquisition — Hello Kitty Rice Bowl with Cover. I see you are a big Hello Kitty fan. I came across a Hello Kitty papercraft and thought of you. Here is another hobby you can try. Check out the site when you have a chance. Do you know where I can get this? My boyfriend is a huge Hello Kitty fan and he loves noodles as well, and I’ve been looking for a way to combine the two for his birthday.